Growing crystals is easy. Fill a plastic bottle almost to the top with cold water and place it in a freezer for a couple of hours. Take it out again at just the right time and the water will still be a liquid but, if you tilt the bottle very gently, it will snap into an amazing snow forest of ice crystals right before your eyes! Growing single crystals for scientific or industrial use in such things as integrated circuits is somewhat harder because you need to combine atoms of different chemical elements much more precisely. At the opposite end of the spectrum from growing random ice crystals in your freezer, one of the most exacting methods of making a crystal is a technique called molecular beam epitaxy (MBE). It sounds horribly complex, but it's fairly easy to understand. Let's take a closer look! 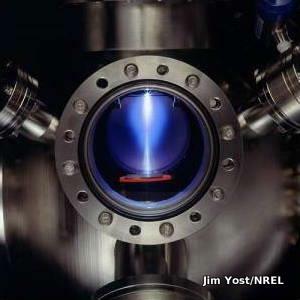 Photo: Molecular beam epitaxy (MBE) being used to make photovoltaic solar cells: You can see the beams around the edge that fire molecules onto the substrate in the center. Photo by Jim Yost courtesy of US DOE/NREL (U.S. Department of Energy/National Renewable Energy Laboratory). What is molecular beam epitaxy? Photo: Molecular beam epitaxy (MBE) in action. MBE takes place in ultra-high vacuum (UHV) chambers like this, at temperatures of around 500°C (932°F), to ensure a totally clean, dust-free environment; the slightest contamination could ruin the crystal. Photo by Jim Yost courtesy of US DOE/NREL (U.S. Department of Energy/National Renewable Energy Laboratory). To make an interesting new crystal using MBE, you start off with a base material called a substrate, which could be a familiar semiconductor material such as silicon, germanium, or gallium arsenide. First, you heat the substrate, typically to some hundreds of degrees (for example, 500–600°C or about 900–1100°F in the case of gallium arsenide). Then you fire relatively precise beams of atoms or molecules (heated up so they're in gas form) at the substrate from "guns" called effusion cells. You need one "gun" for each different beam, shooting a different kind of molecule at the substrate, depending on the nature of the crystal you're trying to create. The molecules land on the surface of the substrate, condense, and build up very slowly and systematically in ultra-thin layers, so the complex, single crystal you're after grows one atomic layer at a time. That's why MBE is an example of what's called thin-film deposition. Since it involves building up materials by manipulating atoms and molecules, it's also a perfect example of what we mean by nanotechnology. One reason that MBE is such a precise way of making a crystal is that it happens in highly controlled conditions: extreme cleanliness and what's called an ultra-high vacuum (UHV), so no dirt particles or unwanted gas molecules can interfere with or contaminate the crystal growth. "Extreme cleanliness" means even cleaner than the conditions used in normal semiconductor manufacture; an "ultra-high vacuum" means the pressure is so low that it's at the limit of what's easily measurable. That's pretty much MBE in a nutshell. If you want a really simply analogy, it's a little bit like the way an inkjet printer makes layers of colored print on a page by firing jets of ink from hot guns. In an inkjet printer, you have four separate guns firing different colored inks (one for cyan ink, one for magenta, one for yellow, and one for black), which slowly build up a complex colored image on the paper. In MBE, separate beams fire different molecules and they build up on the surface of the substrate, albeit more slowly than in inkjet printing—MBE can take hours! Epitaxially simply means "arranged on top of," so all molecular beam epitaxy really means is using beams of molecules to build up layers on top of a substrate. Photo: Molecular beam epitaxy (MBE) means creating a single crystal by building up orderly layers of molecules on top of a substrate (base layer). This bit of apparatus is called a growth chamber. It's only one part of an MBE machine, which typically includes multi chambers (introduction and extraction chambers, two or more growth chambers, an analysis chamber, and a preparation chamber), all kept at ultra-high vacuum (UHV). You might want to create a semiconductor laser for a CD player, or an advanced computer chip, or a low-temperature superconductor. Or maybe you want to build a solar-cell by depositing a thin film of a photovoltaic material (something that creates electricity when light falls on it) onto a substrate. In short, if you're designing a really precise thin-film device for computing, optics, or photonics (using light beams to carry and process signals in a similar way to electronics), MBE is one of the techniques you'll probably consider using. Apart from industrial processes, it's also used in all kinds of advanced nanotechnology research. Why use MBE rather than some other method making a crystal? It's particularly good for making high-quality (low-defect, highly uniform) semiconductor crystals from compounds (based on elements in groups III(a)–V(a) of the periodic table), or from a number of different elements, instead of from a single element. It also allows extremely thin films to be fabricated in a very precise, carefully controlled way. Unfortunately, it does have some drawbacks too. It's a slow and laborious method (crystal growth rate is typically a few microns per hour), which means it's more suited for scientific research laboratories than high-volume production, and the equipment involved is complex and very expensive (partly because of the difficulty of achieving such clean, high-vacuum conditions). Who invented molecular beam epitaxy? Photo: A drawing taken from John R. Arthur, Jr.'s original molecular beam epitaxy patent, filed in 1968 and granted in 1971. Artwork courtesy of US Patent and Trademark office. You can find more details in US Patent #3,615,931: Technique for Growth of Epitaxial Compound Semiconductor Films (via Google Patents). The basic MBE technique was developed around 1968 at Bell Laboratories by two American physicists, Chinese-born Alfred Y. Cho and John R. Arthur, Jr. Important contributions were also made by other scientists, such as Japanese-born physicist Leo Esaki (who won the 1973 Nobel Prize in Physics for his work on semiconductor electronics) and Ray Tsu, working at IBM. Since then, many other researchers have developed and refined the process. Alfred Cho was awarded the inaugural Nanotechnology International Prize, RUSNANOPRIZE-2009, for his work in developing MBE. Molecular Beam Epitaxy: A Short History by John Orton, Tom Foxon. Oxford University Press, 2015. This "short" history runs to 500-pages! Starting from why we need single crystals, it traces the development of MBE from the early use of molecular beams to cutting-edge research into quantum dots and quantum cascade lasers. Molecular Beam Epitaxy: From Research to Mass Production by Mohamed Henini (ed). Elsevier, 2018. A multi-contributor review of the science, materials science, and applications of MBE. The first chapter of the previous (2013) edition, by Secondo Franchi, is a good review of the basics of MBE, its history, and its future prospects; for some reason, that doesn't appear in the 2018 edition. Epitaxy: Physical Principles and Technical Implementation by Marian A. Herman, W. Richter, Helmut Sitter. Springer, 2004. This book covers all forms of epitaxy, including MBE (in Chapter 7). Molecular Beam Epitaxy: Applications to Key Materials by R. F. C. Farrow. William Andrew, 1995. Materials Fundamentals of Molecular Beam Epitaxy by Jeffrey Y. Tsao. Academic Press, 1993. A solid (if you'll forgive the pun) but now somewhat dated introduction. 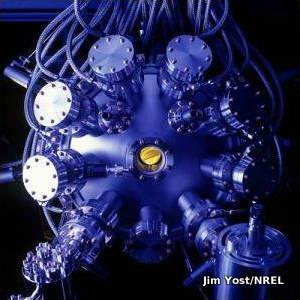 Atom by atom, physicists create matter that nature has never known before by Philip M. Boffey. New York Times, June 1, 1982. Although this is an old article now, it's still a good overview of MBE and the different things it can be used for. US Patent #3,615,931: Technique for Growth of Epitaxial Compound Semiconductor Films by John R. Arthur, Bell Laboratories. Filed December 27, 1968 and granted October 26, 1971. John Arthur's original MBE patent, for which he's listed as the sole inventor, includes a detailed description of the process and six different examples of how it can be used. US Patent #3,666,553: Method of Growing Compound Semiconductor Films on an Amorphous Substrate by John R. Arthur and Francis J. Morris, Bell Laboratories. Filed May 8, 1970 and granted May 30, 1972. A detailed technical description of a process similar to MBE, though for producing films that are non-epitaxial. US Patent #3,974,002: MBE Growth: Gettering Contaminants and Fabricating Heterostructure Junction Lasers by Horace Casey, Jr., Alfred Cho, and Morton Panish, Bell Laboratories. Filed June 10, 1974 and granted August 10, 1976. 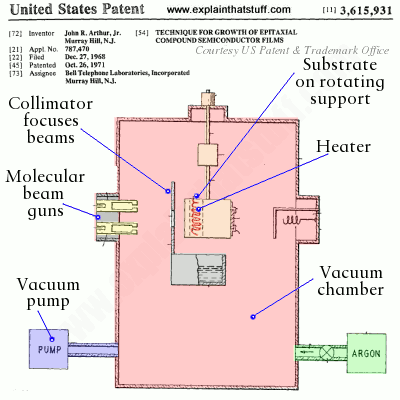 A description of how semiconductor lasers can be manufactured by MBE. How Molecular Beam Epitaxy (MBE) was invented by Alfred Y. Cho. 20 Years of Quantum Cascade Lasers (QCLs) Anniversary Workshop, Zurich, Switzerland, 2014. One of the inventors of MBE talks us through its history and applications. I've set this clip to start with Cho's talk, not the preliminary chit-chat. How Did Molecular Beam Epitaxy (MBE) get started in 1960s? A much longer (2-hour) history from a 2014 symposium with three speeches by the key pioneers of MBE: John Arthur, Alfred Cho, and Tom Foxon.